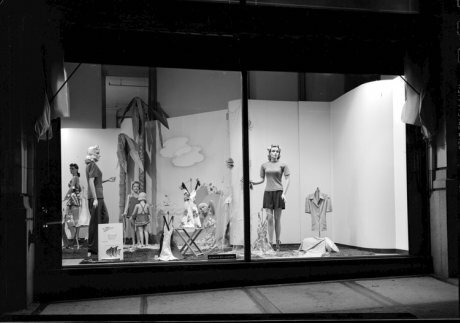 Long before KitchenAid created the stand mixer, before Ralph Lauren designed ladies’ dresses and before Levi Strauss & Co. produced denim overalls, the Hudson’s Bay Company set up shop in Victoria. In fact, in the early 1840s, the Hudson’s Bay Co. was nothing more than a trading post at the southern tip of Vancouver Island. Discovered by John Douglas and briefly known as Fort Camosun and Fort Albert, the post was officially named after Queen Victoria in 1843. It would be another 80 years before work on the historical Hudson’s Bay Co. building would break ground on Douglas Street. Acting on advice from the famed London department store Harrod’s, the Hudson’s Bay Co. wanted to modernize their entire image and to be presented as much more than just a dry goods retailer. Construction began in 1913 and, after a brief suspension due to World War I, the Hudson’s Bay building was finally completed in 1921. 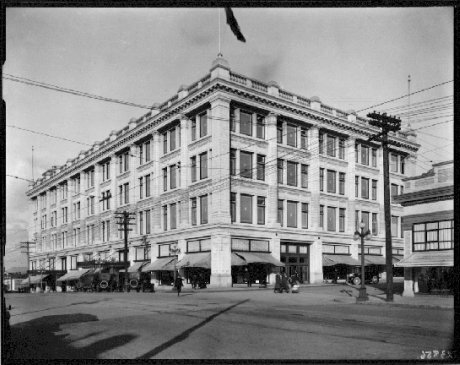 Over the next several decades, as the fashion retail world began to rapidly expand, so too did the Hudson’s Bay Co. and its Vancouver Island location. 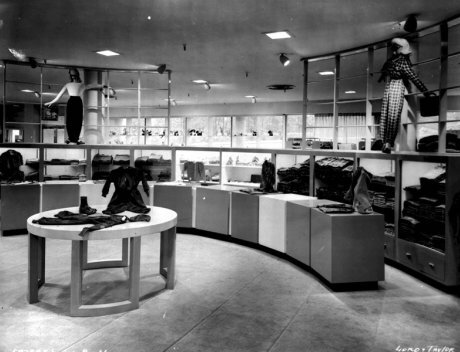 The retail space was expanded with a new addition in the late 1940s and in 1950 the very first escalator on Vancouver Island was installed in that retail expansion. 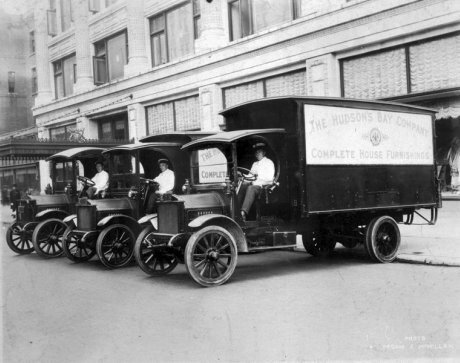 On the company’s 333rd birthday in 2003, the Hudson’s Bay Co. – now known simply as The Bay – moved down the street into what was once occupied by Eaton’s. The original Bay building was subsequently listed in Victoria’s heritage registry while it awaited redevelopment. 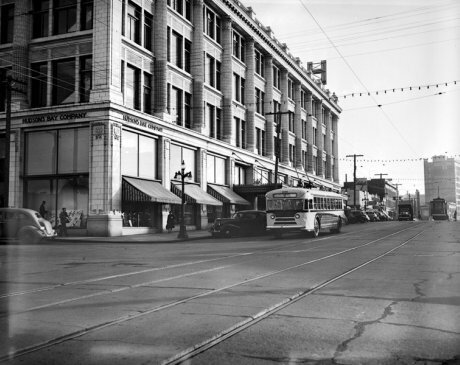 Three years passed before the former Hudson’s Bay Co. building, on Douglas Street between Herald and Fisgard Streets, would be purchased by Townline. Since that time the building has been carefully and lovingly restored. 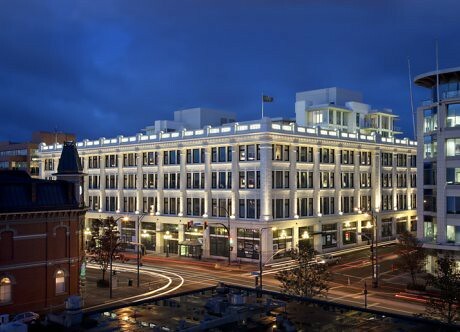 What was once the Hudson’s Bay Co.’s first Vancouver Island home is now a stunning collection of modern flats, lofts and penthouse spaces. All archival photos © BC Archives Collection private archives. Factual information provided by The Hudson and its developers. I remember the Hudson when living in Victoria. When I went back to find that it’s not really there.. it made me sad. Keira-Anne, thanks for the great story about the history of the HBC in Victoria! Awaiting your take on the changes…I am glad they kept the heritage look. Great post, Keira-Anne! looking forward to reading you story post stay. Enjoy your time in Victoria and I look forward to meeting you on Saturday!